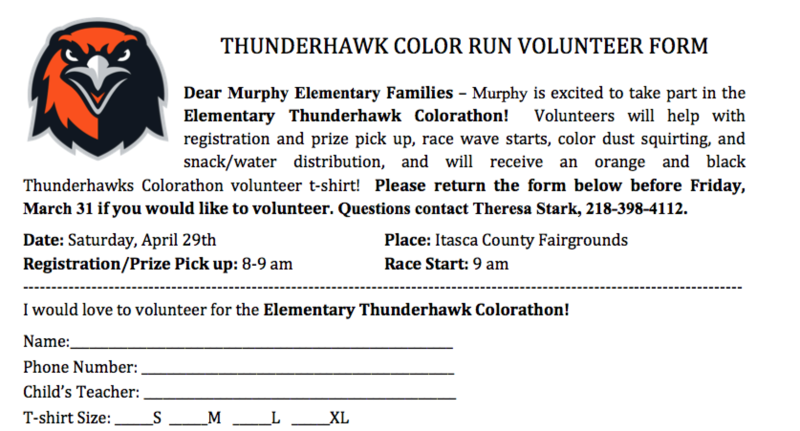 Dear Murphy Elementary Families – Murphy is excited to take part in the Elementary Thunderhawk Colorathon! Volunteers will help with registration and prize pick up, race wave starts, color dust squirting, and snack/water distribution, and will receive an orange and black Thunderhawks Colorathon volunteer t-shirt! Please return the form below before Friday, March 31 if you would like to volunteer. Questions contact Theresa Stark, 218-398-4112.